I love chowder. A while back I featured a scallop-corn chowder that’s still a favorite. But it’s a little bit fussy, having to pre-cook the scallops first. 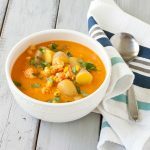 So when I found I had thawed a bag of langostino meat (a cousin of lobster) for a dish I was no longer making (long story), I decided to create a new chowder recipe. 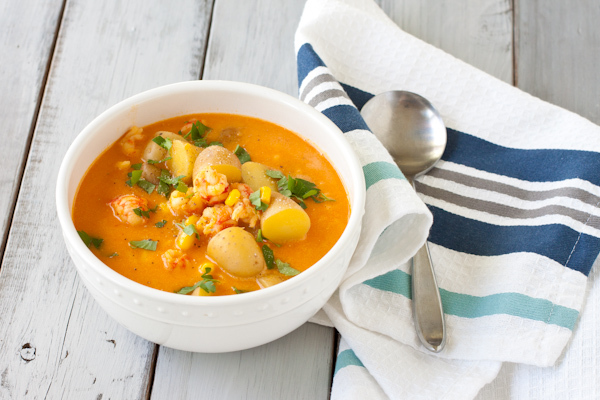 This one uses coconut milk blended with organic frozen corn and a roasted red bell pepper (capsicum to you readers outside the U.S.) to create a creamy, dairy-free base. That’s when I know I’ve done well. Enjoy! Note: Be sure to read the package. There should be only langostino (sometimes called langostine or squat lobster) in the ingredients, no sodium or other preservatives. Look for wild-caught if possible on the package as well. Langostino (Spanish for “little lobster”) are more closely related to hermit crab than lobsters. The taste is similar to lobster tail, perhaps a little less rich, while the texture is closer to shrimp. Rich, creamy langostino chowder, you won't believe it's dairy-free. Sprinkle the saffron into the hot water and let sit 10 minutes to bloom. Add coconut milk, roasted pepper, and 1 cup of the corn kernels to a blender and blend until smooth and creamy. Put all remaining ingredients except the langostino into a large heavy-bottomed saucepan or Dutch oven. Bring to a boil. Reduce heat and simmer 20 minutes until potatoes are just tender. Stir in langostino, cook 5 minutes. Top with finely minced parsley if desired and serve at once. This was delicious, although the recipe could be more clear. 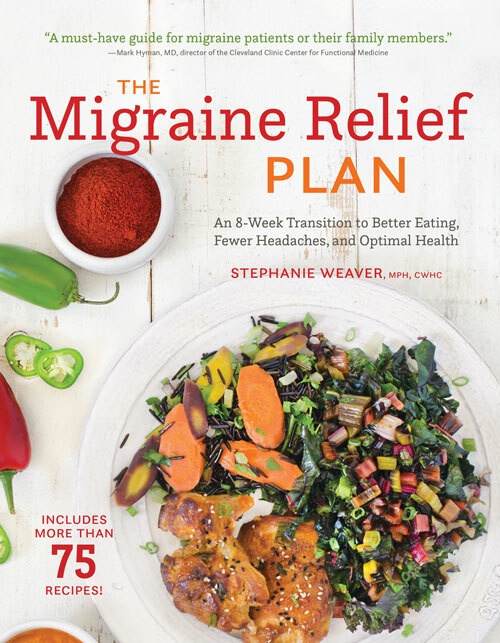 I used a full can of coconut milk in addition to the saffron-infused water and a full jar of Trader Joe’s canned roasted red peppers (I’m guessing that was a pepper and a half). By blend…do you mean to emulsify? When do you add the next cup of corn. When do you add the pepper and salt. Are we to roast pepper before adding? Hi Michael, I updated the instructions to make them clearer. You use a blender to create the base for the chowder. Then add the rest of the ingredients. Perhaps you didn’t notice it, but the recipe called for roasted red pepper. Enjoy! Appreciate all the sharing Alisa! Thank you. You have ended our suffering. You are welcome Peg. Thanks for being such a fan. I love chowder too, and this one looks sensational! Definitely pinning it for later. Thanks Helene. Let me know if you try it!